I have been seeing lots of red velvet recipes on Pinterest these days and it has reminded me of my favorite childhood cake. My Aunt Carolyn always made it for special occasions and it was absolutely delightful! I have never eaten or seen that same kind of cake again. My aunt called it Red Devil’s Food Cake rather than Red Velvet. 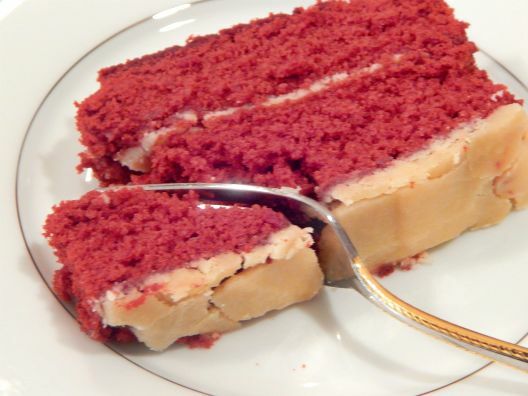 Sure, I’ve had lots of red velvet cakes, but none that ever tasted quite like my aunt’s. So what was the difference? 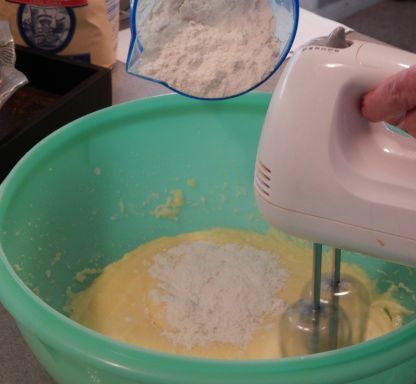 Although I don’t bake often, I felt like I needed to get this recipe from my aunt and give it a try. I felt like it was simply one of those recipes that need to carry on in the family. Did I figure out the difference?…Well, at least a couple of differences. My aunt’s cake uses brewed coffee in the batter, and the icing is completely different, not a cream cheese icing. 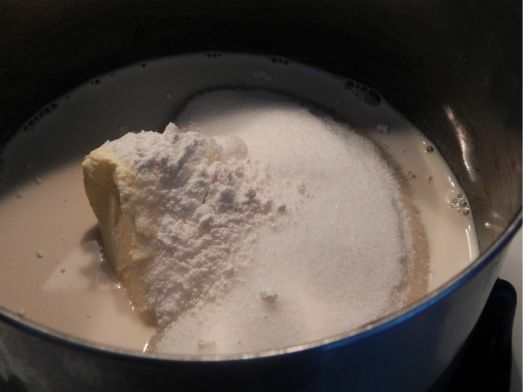 First, cream the sugar and shortening. 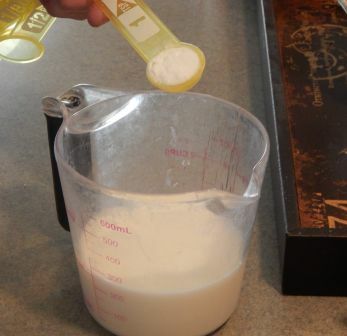 Mix the buttermilk and soda and set aside. 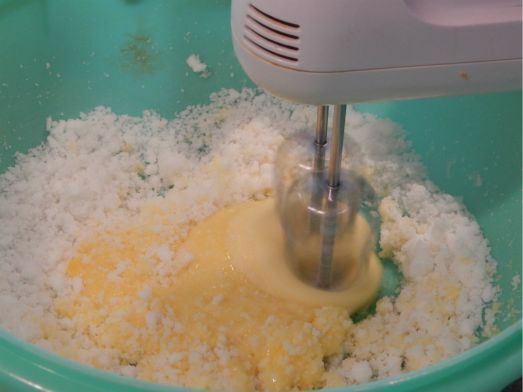 Add beaten eggs in with the sugar and shortening. 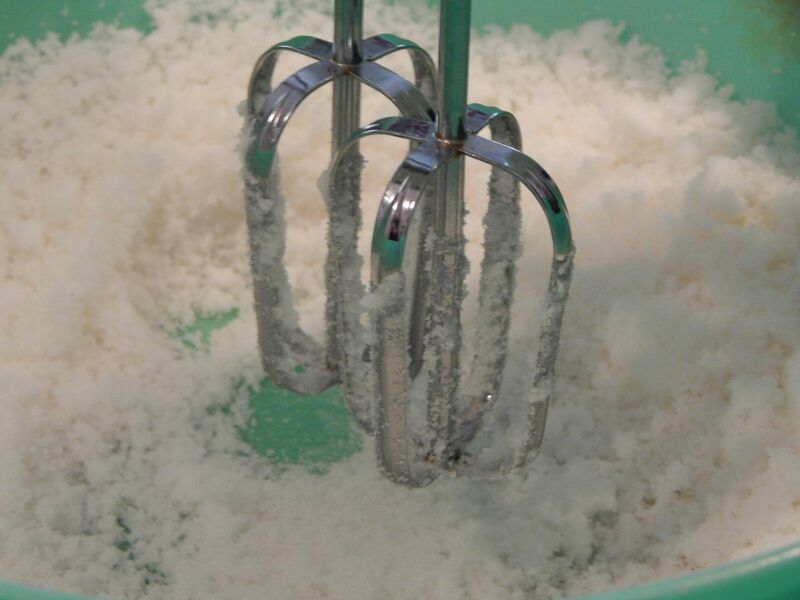 Add the sifted flour with salt and buttermilk/soda mixture alternating each a little at a time and mixing in between. 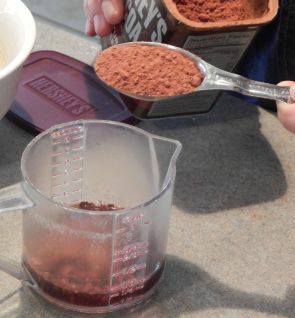 Mix the brewed coffee and cocoa, and then add to the above ingredients. Finally, add the vanilla and red food coloring to get the color you desire. 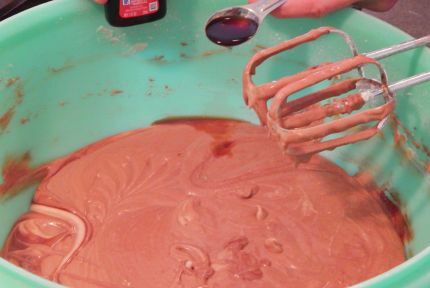 Pour batter into two round cake pans and bake in a preheated oven on 350 degrees. Bake for about 22 minutes, checking the cake with a toothpick until it comes out clean. 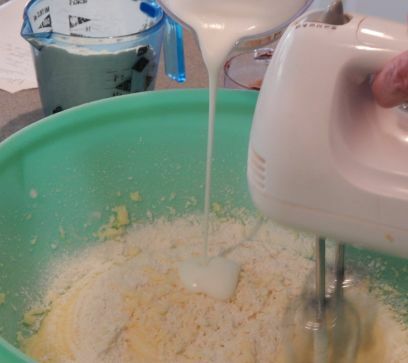 Allow the cakes to cool on a wire rack before taking out of the pan. 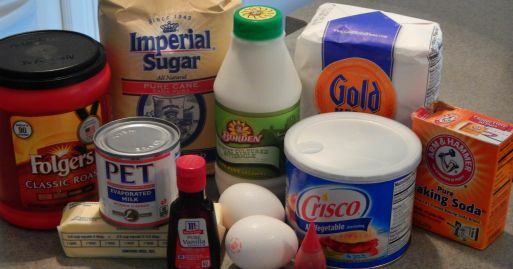 While the cake is baking, begin cooking the icing. 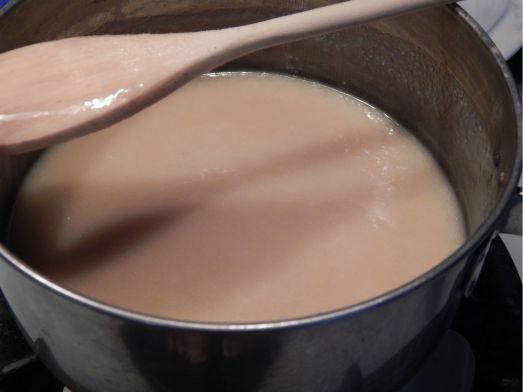 Place all the ingredients for the icing in a pot and bring to a boil. Boil for 1-2 minutes stirring constantly. Let the icing cool, then beat a little more to thicken if necessary. Pour and spread a layer of icing between the two round cakes as well as on top. 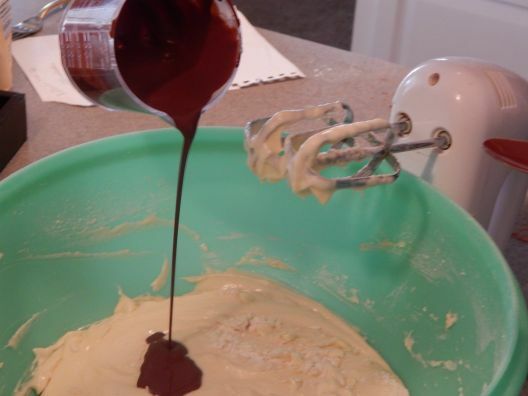 Alternatively, you could do this as a sheet cake instead, and just pour icing on top. Although it would not be as pretty, it would be easier and taste just as wonderful. My aunt told me that the most difficult part of this cake is getting the icing thick enough to spread easily on the cake. I thought maybe I could add a little more than 1 tsp. of flour and it might solve that problem. That turned out to be a mistake because it made the icing too thick. This icing is really meant to be more like a glaze, so it will be a fairly thin icing. But, trust me…it is delicious that way! Although my icing was a thicker consistency than what I wanted, the taste was still what I remembered! Next time, though, I will just use the 1 tsp. of flour. Lesson learned. Regardless, of my mistake with the icing, it was a hit with my family! They loved it as much as I always did as a child. 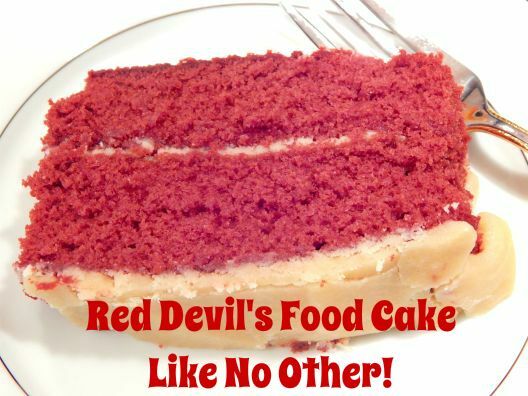 Looks like I will be getting plenty of practice in the future making this scrumptious red devil’s food cake!